Extreme Eating: More than a Beakful! A Great Blue Heron holds a large fish in its beak at Bombay Hook National Wildlife Refuge, in May 2009. Image by Derek Stoner. After bellying up to the Thanksgiving table yesterday and filling up on too much food, many of us probably feel like we’ve eaten more than humanly possible. For a bird, though, our consumption rate relative to our body size may not seem like much. Many birds routinely eat 10 to 20 percent or more of their body weight each day. Imagine an average-size human eating 20 pounds of food at a sitting! That’s extreme! Today’s photo shows a Great Blue Heron that may have grabbed more than it can swallow. A large fish shows evidence of the heron’s stabbed with its beak, but with no teeth to cut the fish into pieces, the heron is struggling to swallow the fish whole. 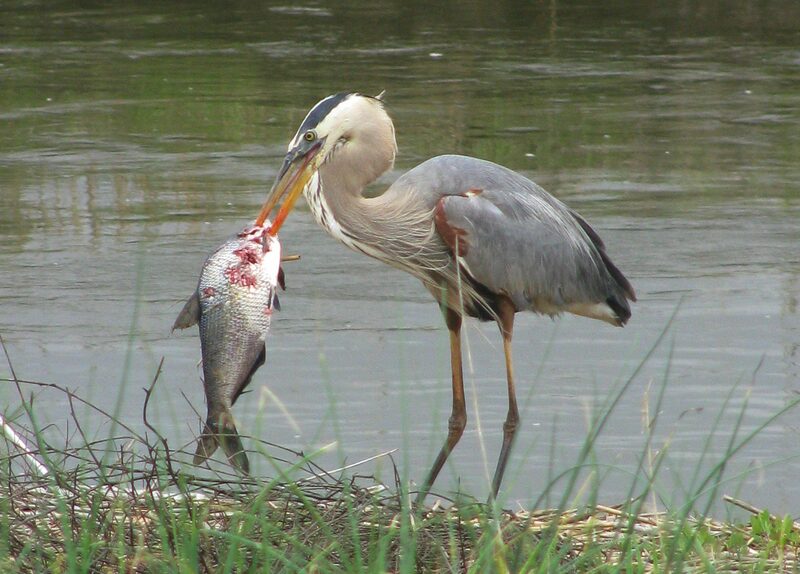 I did not witness the conclusion of this heroic eating attempt, but we can only guess that the heron tried its best to devour the fish! Can you identify the species of fish to its proper family? The first correct answer posted in “Comments” will receive a copy of Delaware’s Freshwater and Brackish-Water Fishes. Cyprinidae family- native to Europe and Asia! ????? I’ll give it a try – is it a Shad? And I’ll try and be more specific – maybe Gizzard Shad?